At one point there were giant oranges lurking along many of the highways throughout California. These giant oranges operated as juice stands, eagerly awaiting thirsty travelers to pull over and partake of their fresh cold orange juice. At a time when most cars didn't have air conditioning and the highways were not the super fast freeways with on and off ramps of today, the orange stands did a busy and successful business. 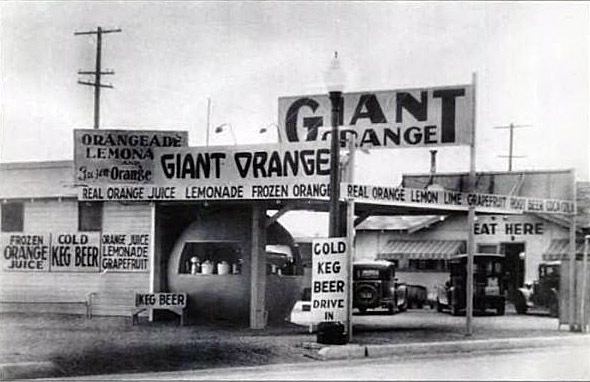 In 1926 Frank E. Pohl started his chain of "Giant Orange" stands opening up his first orange shaped stand on what was 11th Street near E Street in Tracy. Before trying out orange juice stands, Pohl had a giant lemon from which he served lemonade in Menlo Park called Jumbo Lemon Stand. But his first "Giant Orange" was in Tracy, California and spawned a franchise and imitations throughout California. The franchise peaked in the 1950's with approximately 16 different stands built throughout Northern California from Bakersfield to Sacramento to Merced and Redding. It's rumored that a stand could easily go through six thousand oranges during a week as it quenched the thirst of weary travelers who pulled over for a quick drink. There were giant oranges in at least Tracy, Dixon, Bakersfield, Tulare, Madera, Chowhcilla, Merced, Turlock, Redding, Galt, Roseville, Sacramento, El Dorado, Banta, Vacaville, Modesto, Lodi, Williams, Patterson, and Placerville. And some of those cities such as Tracy and Dixon had two giant oranges! Paso Robles additionally had a giant orange located on Spring Street that lasted until at least the 1950s. The girls who worked at it wore roller skates. Giant Orange Stands were so popular that in the 1930s there was even a small war in Tracy between Frank Pohl's giant orange (on the north side of 11th Street near E Street) and a copy cat establishment called The Orange Basket (located on E 11th Street). The Orange Basket opened in 1934 right next to Tracy High School. In 1935 Pohl filed a lawsuit claiming that the Orange Basket was stealing his Giant Orange trade name and confusing customers. Of course, the lawsuit was thrown out, the judge stating that you can't claim sole use of the word "orange". The Appeals Court upheld the decision. The Orange Basket was open until 1966, when it burned down, catching fire from a lit cigarette. It was called "Jack's" in the end. The property it sat upon was incorporated into Tracy High School, somewhat fitting since much of its clientele were high school students. After the 1950's the stands began to decline as roads were converted to higher speed freeways which made it more difficult to easily pull over and stop for a glass of orange juice. This combined with the emergence of air conditioning in cars, began the decline of the giant orange juice stands. Today a few giant orange stands still remain. Dixon, San Jose, Berkeley, Lemon Cove, Chowchilla, Williams, Fontana, and Riverside all have a giant orange stand, or at the very least a replica of one in the case of Riverside. There are still at least two of the Frank E. Pohl's sixteen original orange stands remaining. The first stands in Dixon, California and until a few years ago operated as a Mexican restaurant. 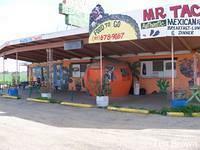 It was called George's Orange and was part of the restaurant, Mr. Taco. During this time period the orange had a very interesting paint job consisting of images of mustached gentleman in sombreros. Thanks to Tim Brown we have several pictures of this historic orange from that time. Sadly, the restaurant closed and has been listed for sale for awhile. In 2015, the entire structure, orange included, was repainted, so the orange now has a fresh coat of orange paint on it. The building including the orange might be lucky enough to have been declared a landmark. 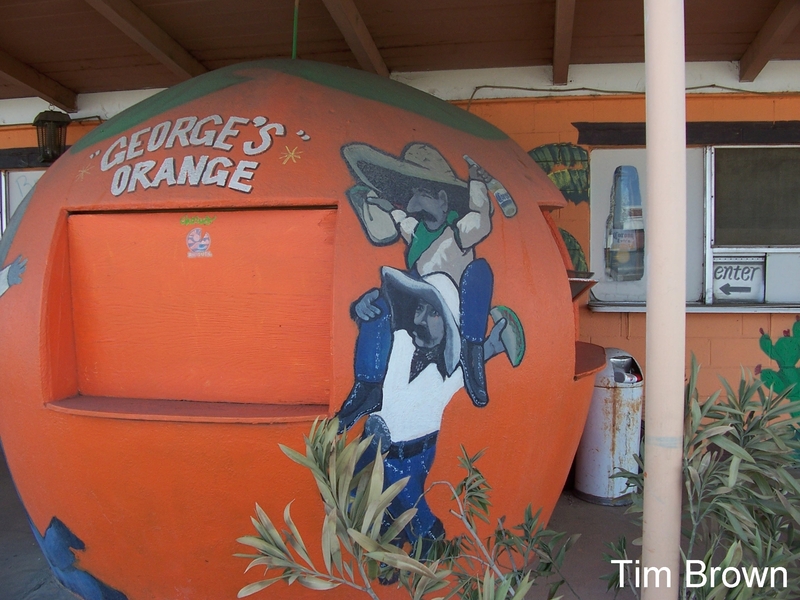 This orange is also notable as it was operated as an orange juice stand all the way until July 15th, 1973 and was the last of the giant orange stands to remain in business. 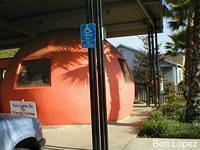 The other Frank E. Pohl orange remaining is in San Jose. Originally located at 1920 Alum Rock Ave, this orange was relocated in order to make room for a housing development. After being declared a historical city landmark the historic building was moved to 48 South Capitol Avenue. Today and since 1947, the orange has been utilized by Mark's Hot Dogs. Mark's Hot Dogs originally opened in 1936 and relocated to the orange in 1947. The business was started by Mark Yuram. As far as I can tell the orange was also constructed in 1936, and was placed on the original Alum Rock Avenue site in 1947 when Mark's Hot Dogs moved into it. It became a city landmark in 1992. The current owner is Demos Pantelides. Visiting the hot dog eatery is a fun experience. The inside of the orange is all restored and painted with orange tiles. Two stools are situated so you can actually eat at the counter inside the orange. Since that's obviously not enough seating, there are four large tables outside the orange, as well as some out door counter space with attached stools. And if that still isn't enough, they provide car service, both taking your order and bringing it out to you while you remain in the comfort of your automobile. In Berkeley is a privately owned giant orange. 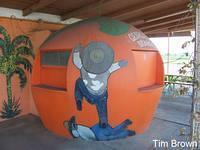 Owned by architect Bruce Dodd, he located this giant orange being used as a chicken coop up near Corcoran. He had it extensively restored to the shining example now residing on his property. Dodd now uses it to entertain, enjoying playing with his grandchildren in it. It was not the first giant orange he attempted to purchase, however. The first was an orange located near Chowchilla. Sadly, the night before it was to be transported to his home in Berkeley it caught on fire and burned down. The Giant Orange is located on Spruce Street and can be seen from the top of the driveway. I sadly did not get to meet Bruce Dodd or see the giant orange up close, as right as I pulled up, my baby daughter passed out on me. A few houses further north on Spruce Street, on the other side from Dodd's house, several large and colorful statues also exist. I am not sure what their story is, however. Nearby colorful statues, also on Spruce Street. 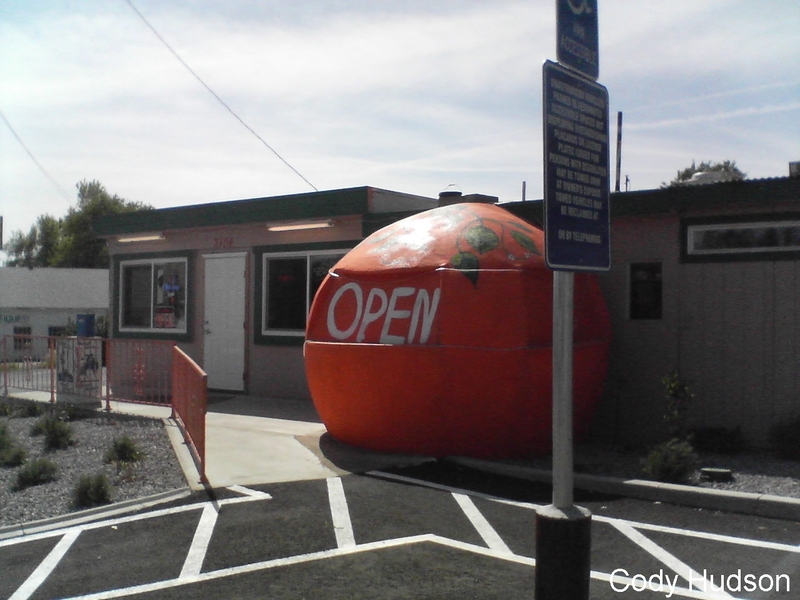 Besides Frank E. Pohl's orange chain, several other giant oranges sprung up along Route 66. At one point, much like Pohl's chain which spread throughout Northern California, the orange producers of Southern California in order to gain supplemental income, opened their own orange stands along this historic route. One remains standing. This one is Bono's Historic Orange Stand. It belongs to Bono's, the Italian restaurant to the left of the orange stand. 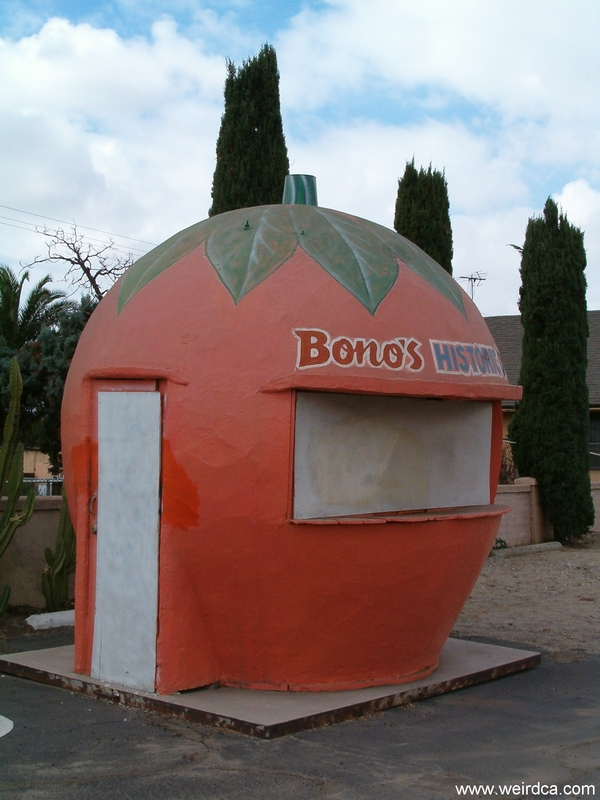 Bono's originally opened in 1936 in order to add supplemental income to the family's orange grove business, but is now currently closed after the original Bono family passed away. The current generation has so far not done anything with the restaurant nor with the old orange stand. In fact from the windows it still looks like it did the day it was closed, complete with table settings laid out. Other than that, a Historic Route 66 interstate sign is spray painted on the pavement just to the left of the stand. Hopefully one day this large orange will once again be a popular destination for food and drink. 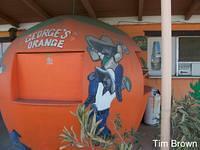 Along 198, just north of Lemon Cove, on the way to Yosemite, there is another giant orange. 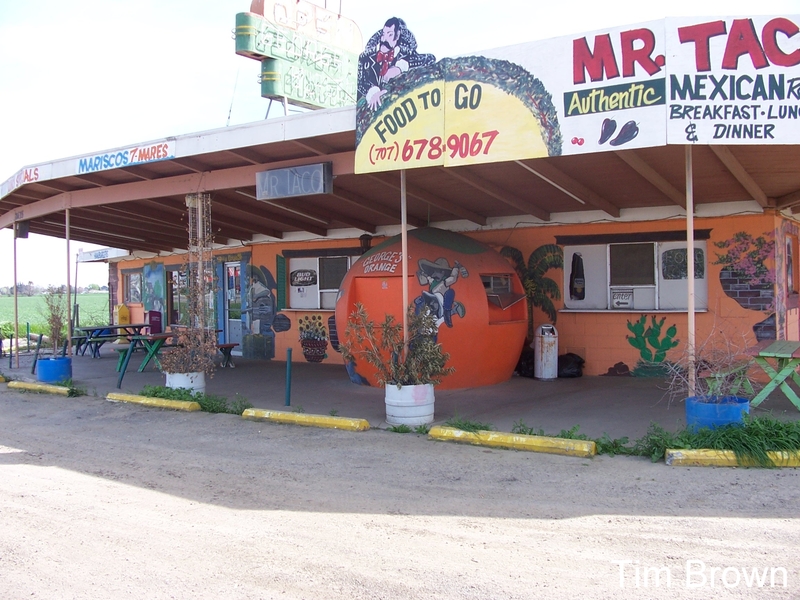 Referred to as The Big Orange, it is part of the Mesa Verde Ranch and is actually attached to an existing fruit stand. At the time we stopped by, although it was not selling orange juice, it was actually selling oranges and other fruit. The giant orange appears built into the building, being part of the corner. Heading southwest from Lemon Cove along 198 you will additionally run across the giant carved wooden head of John Muir. Believed to have been built in the 1940s, also by Frank E. Pohl, it started in Chowchilla before being relocated to Fairmead in 1954 along the east side of Route 99. It was called the "Mammoth Orange". This giant orange was located around 22150 Avenue 22 1/2. Sadly in 2008, changes to the highway made it impossible to get to it. It was originally located at an intersection on the highway, where you could actually cross the highway. In 2008, this intersection was eliminated in order to make the highway safer, as the state was removing all such intersections along Highway 99, with the nearest offramp from being about a half mile away from the orange. The Mammoth Orange remained in its location for four years, slowly deteriorating before finally in 2012 it was relocated back to Chowchilla outside the Fossil Discovery Center. It has sat there in the parking lot awaiting restoration with current plans being to use it as a concession stand for the center. It is open in the back and use to be attached to a building when it was on Highway 99. The building on Highway 99 is now gone as well. Nearby, on the west side of Highway 99 was another giant orange. Called Fast Eddies Mammoth Orange, at one time it was owned by the same people who owned the other Mammoth Orange. By at least 1991 the stand was closed and it was demolished in the mid 1990s. At the time of its closure it sported a blue and white paint scheme with blue and white stars. 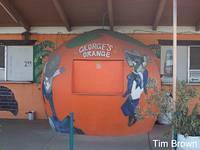 Joe's Giant Orange Cafe in Shasta Lake inhabits another one of these old historical giant oranges. Built in 1946, this is an original Frank Pohl orange and was originally located in Redding on Highway 99. Now, Joe's is a mix of American and Mexican food and if reviews are true one of the best places to eat in all of Shasta Lake. They apparently also serve excellent orange drinks like an orange shake. Outside the California Citrus State Historical Park lies a replica of giant orange stand. Located at the corner of Van Buren Boulevard and Dufferin Avenue, the replica welcomes visitors to a state park consisting of 377 acres. The state park, established in August 1993 has 87 different varieties of citrus. A visitor center and museum is located in the park along with trails, picnic areas, an outdoor amphitheater, and large gazebo. Most importantly there are 186 acres of citrus groves and visitors will literally drive down roads lined with what appears to be endless rows of orange trees. Berkeley - privately owned giant orange. Located in Corcoran before being moved to Berkeley. Chowchilla - formerly the Mammoth Orange located on Highway 99. Now outside the Fossil Discovery Center of Madera County in Chowchilla. Dixon - formerly George's Orange, now vacant. Lemon Cove - On California Highway 198 just north of town. Riverside - outside the California Citrus State Historic Park is a mockup of a giant orange juice stand. San Jose - Mark's Hot Dogs. 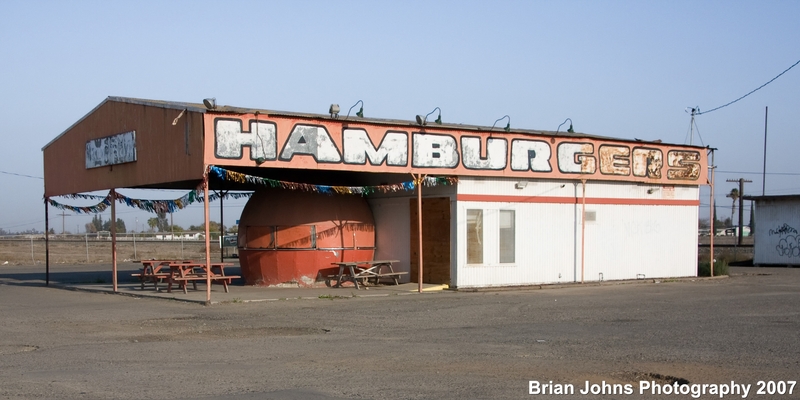 Williams / Colusa - on 7th Street (old highway 99) is possibly an abandoned giant orange stand in disrepair. Cartago - there's some strange orange hut like structure in this small town along Highway 395. Not really an old giant orange stand. 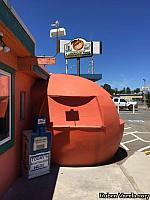 Joe's Giant Orange used to reside about 1/4 mile north on the edge of Highway 99. We simply called it the "Giant Orange". My Dad, George, and my uncle, Walter, constructed the orange in 1946. We lived in a small 2 bedroom, 1 bath house directly behind the orange. Walter and his family lived just north of our house on the same property. I got to have a hot dog and orange juice one time per week. We had a Giant Orange at, I believe,on the north of Phoenix, near Medford. I remember getting to have only one because it was to far to drive in those days, 30 miles, early 50's. Oh yeah, in the old days with no A/C the great taste of OJ half way home to S.F. to stop in Dixon was a real treat. Remember them well. On Hwy 99 near Tagas Ranch just North of Tulare a Giant Orange sure hit the spot when I was 10 yrs old and Summer temps were well above 100 degrees. I remember most the large paper cups with fresh OJ and shaved ice about 50/50 - a drink of that was so refreshing and helped wash down a foot long hot dog on while sitting on the picnic tables that were shaded by the long over hang attached to the Giant Orange. Often copied but never duplicated as far as I'm concerned. I grew up in east San Jose just off Alum Rock Ave. I used to pass Mark's Hot Dog stand on Alum Rock Avenue while taking the bus on my way into downtown San Jose. When I got my own car I ate there once in awhile. Great hot dogs. The area got pretty seedy in the 70's and I moved out of San Jose and have not been to the location on South Capitol, although after reading the article you wrote I will be making a point of going back to have a hot dog and relive old memories. Hey Bruce Schimdt, your cousin Linda here. Wm's daughter & Frank's great grand daughter. Miss the Farmead orange so much. Hey to Bill Orr too. Were all Giant Orange afficianados. Thank you, Grampa Frank for creating them ! My Grand Father, William Pohl, was Frank E Pohl's brother I believe and it seems i have some relatives here i didn't know I had. m My whole family has very fond memories of the nostalgic and iconic Giant Oranges. I worked at the Giant Orange on West side of Hwy 99. It was between Madera and Chowchilla just south of the 152 turn off. It was owned by Eugene Jay. Squeezed tons of oranges, lemons, and limes. Also served burgers and hotdogs. Regular sized burgers, fully loaded were 4 for $1.00. Those were the days. I met so many interesting travelers and yes we had our regulars. Moved on, but truly no regrets. 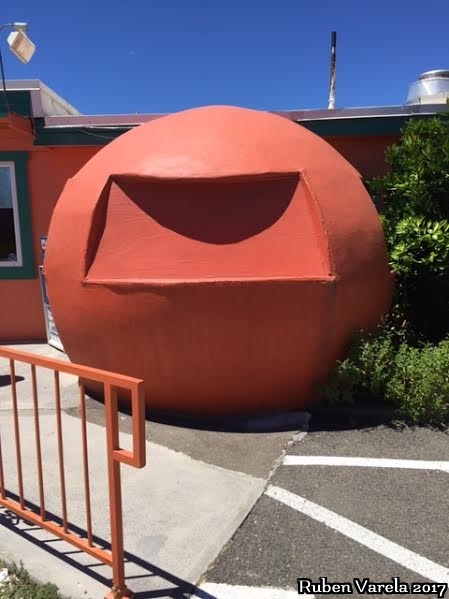 Not sure if this has already been posted, but there was a Giant Orange located in Ukiah, Ca. at the south end of town just past the airport on the east side of Old US 101. This may sound odd, but I am actually more nostalgic for the inoperable dilapidated ones, Those are the ones I remember from childhood road trips in the 70s, by then they were nearly all closed but still sitting on the side of the road, us kids got a huge kick seeing the old oranges. "Hot and thirsty?" the radio voice would inquire. "Well, just head for the Giant Orange high in the sky over Center Tracy!" And sure enough, there must have been half a dozen Giant Orange stands inside the central blocks of Tracy, California, each resembling a huge orange with service windows cut into its sides. High above the original Giant Orange, a radio tower rose high to broadcast an invitation to visit the Giant Orange stands. Halfway up the tower a huge mock-up orange was suspended in the sky. "What could be better than a cup of ice-cold orange juice on a day like this?" the radio message droned on. "Well, all you need do is to head for the Giant Orange, high in the sky over center Tracy!" Dad had actually stopped for a Giant Orange once, and let me tell you, it was cold and sweet on the first taste, and sweet and cold to the very end. But he knew the forty cents it cost for four cups of pleasure would be better spent in putting a little more gas in the tank and to my regret we never again stopped for another Giant Orange. My first job was at the Giant Orange stand in Banta when I was 15. Yes, sliced tons of oranges for the best ever orange freezes. I remember Modesto CA having one on 7th street circa 1980s. But it was vacant for as long as I can remember. I remember when I was a kid we were traveling down the 99 freeway. Right around Earlimart Ca. There was one that was bearly standing with grafftii all over it. My parents were telling me all about the old big orange stands. Ever since then I took an interst in them. When the last one in Fairmead closed 5 years ago. It was a shame. That should of been a landmark the last of a dieing breed. Well good news is they are going to reopen it. Lets just hope they keep it the same. Alaska sized hamburgers. Bono's orange stand on foothill Blvd (route 66) is still standing; I pass by it several times a week on my way to the medical marijuana dispensary in Fontana. The Giant Orange of Chowchilla is being reassembled and will stand at the Fossil Discovery Center, off Highway 99 near Fairmead. 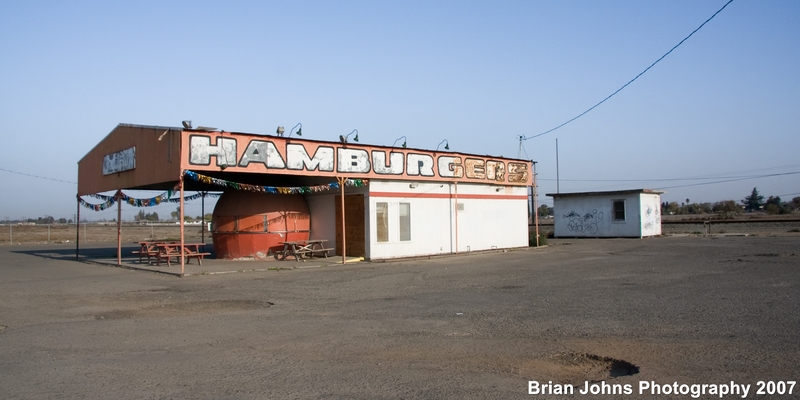 I believe the Chowchilla one was the last one standing and it is now gone. The building is still there but it they took the orange out and it was a hamburger place for a while but now I think it's just an empty building. The last time I saw a Big Orange stand was in 1945 . The stand was located on the side of route 44 just after the Carquinez Bridge going west toward Pinole. I know we used to stop and buy orange juice on our way to Frisco. I also think they sold hamburgers and fries. I would ask my dad to put muster, pickle, and onion on mine. They also served greasy fried string bean potatoes in a cone shaped container. Best fries I ever had.I really miss that. I was about nine years old during that glorious period. Besides the stand on 11th St. (Hwy 50) there was one at the east end of Grant Line Road. The sign for that one was still there until about 10 years ago, but not the stand itself. I remember in the sixties a sign just before a Mammoth Orange warning that "The next orange is not a genuine Giant Orange"
I lived in Tracy CA in the 50's and the Giant Orange was owned by my next door neighbors Flo and Ollie Hartman. My first summer job was at the Giant Orange on Hwy 50 in Tracy. I sliced thousands of oranges in half that summer of 1961. The Giant Orange is long gone now but thousands of cars and busses would stop to refuel their thirsty bodies to and from the Bay area. I noticed a few posts from the great grandchildren of Frank Pohl. My father has told me stories about his father building the Giant Orange juice stands from Davis to Tracy and they were called the Giant Orange. Unfortunatly my grandfather died in 1962, when my dad was 13 and my dad doesn't recall much. I did some research and found that my grandfather had been married to Frank Pohl's daughter Bernadette in the 1920's and 30's. They would have been married when these stands were started. I am wondering if maybe Frank and my grandfather Andrew James Hansen started the business together. My dad used to tell me the stories about his dad and the orange juice stands before he knew that his father had been married to Frank Pohl's daughter. I wounder why Andrew James Hansen receives zero credit when I am certain he played a significant role in these stands. I live in the neighborhood right behind the giant orange in Shasta lake. I know a lot of people at my high school love it And drive up here to take pictures with it. I'd love to share this new information about it with them. Also if you need any info or pictures of it let me know. They do serve a great breakfast! I grew up in Tracy, Ca. and remember the Giant Orange. It was along the old Highway 50 which is now 11th St. Can anyone tell me why it was the first one that he opened? We never had the money to spend on the juice, but the shape and color were right out of a story book. That bright orange enamel over stucco made for a brilliant giant orange. I became very familiar with the one on Highway 99 in Atwater, after it closed due to rerouting of the highway. I was 6 years old and ran my hands over the orange stucco and wished the place were mine. The 'Giant Orange' near Redding is still there and was the subject of a news story tonight (3/10/10). 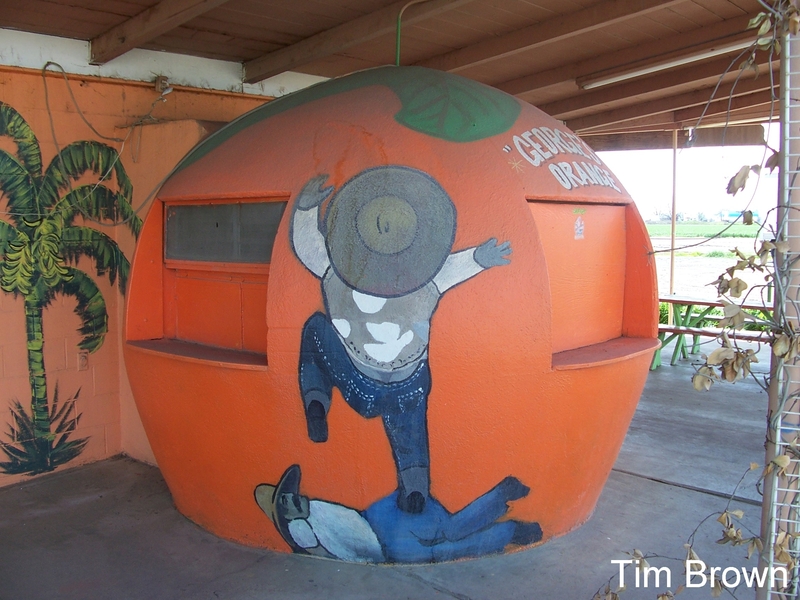 You might also find it interesting to note that in Orland, California we had one of the "Giant Orange" predecessors a "Giant Lemon." It still exists as part of the Glenn County Fairground's "Heritage Trail." Frank E. Pohl was my great grandfather. he and my Grandfather ran the giant ornges for year. my mom is till alive and remembers a lot about the oranges. my grandfather used to build the oranges in his garage in Sacramneto,CA. i used to go with my dad to orange coumty to pick up oranges and lemons and grapefriut and limes during the summer time. it was aold truck and it vaporlocked a lot lot of fun. i have a book that a person in davis wrote about the giant oranges. A few years ago one of Huell Howser's producers contacted me after seeing my California orange stand web page (see earlier comment). She said they were considering a program on the orange stands and asked for my help but when I contacted her later she indicated the idea had been dropped. Too bad. My parents owned and operated the Big Orange that stood on the corner of Paxton Blvd. and San Fernando Road in Pacoima, Ca. This was circa 1949-52. The "Giant Orange" stands were a welcome sight for travelers when driving in autos without A/C in the Summer. We always stopped at one just before entering Sacramento after visiting in the Bay Area. They were fun and the orange juice was delicious. I wish we had more of them today, and I also wish Huell Howser would do a segment on the story of the "Giant Orange." I remember working at a Mammoth Orange when I was a kid (1941 - 42) My parents ran a Richfield 76 gas station and motel north of Madera.. And it had a Giant Orange.. was on the west side of Hwy 99... The War put a bug crimp in travel and we left the business. My daughter was wondering if I or anyone had a photo of that orange. We have a giant Orange in Williams, ca. highway 99 and J st.
Hey, even the editors of Hot Rod Magazine were so moved by the loss of the Mammoth Orange near Chowchilla that they published a full page memorial to the place in the May, 2008 issue. I can empathize completely because we are losing many of our "Old Florida" roadside attractions in the name of "progress"(?) in my beloved home state. I love my state and yours as well. I find myself reluctant to say farewell to the way things used to be. I know that it's impossible to miss what you never had, but it's unfortunate for future generations to miss out on the simple pleasures we all once enjoyed. Bigger, newer and glitzier are seldom BETTER. My great grandfather was Frank E Pohl. As a young teenager, I remember working in the stands, cutting oranges, lemons, and limes as well as crushing large blocks of ice. We could go through hundreds of cases of oranges on any summer holiday weekend. The original orange stands of Madera, CA., were move to Ave 24 in Chowchilla CA. I don't believe either of them remain today. The City of Shasta Lake Orange is alive and well. It is reputed to serve one of the best breakfasts in Shasta county. Try the steak breakfast! Yup, there's a Mammoth Orange in Chowchilla. It's the highlight of the highway. Sadly, they're doing some highway work and taking off the highway exits and building a new offramp, so it's closed, for sale, and i'm pretty sure they're going to move it. Last i heard, a buyer was interested in turning [it] into a grocery store. Let's just stick together and hope these unique places keep serving delicious orange juice, whatever happens. I've heard from several friends in the past few days that the Mammoth Orange near Chowchilla, CA, has closed. Apparently the local Fresno television stations covered the story on its last day of business. The biggest change that has happened there recently was the closing of the center divider of Highway 99 that formerly allowed southbound drivers to turn across the northbound lanes to access the business. In the central San Joaquin Valley it has long been possible to actually cross the roadway of Highway 99 at many points, a leftover from the days when a farmer had land to deal with on both sides of the highway and needed to move his equipment across both directions of traffic. As you might imagine, there have been some spectacular crashes because of that feature. Now the state has become serious about eliminating all those crossings, one of them being at the Mammoth Orange. I imagine it has adversely affected their business, though the locals still know how to get there from the north, while most highway drivers that aren't from around here were probably too intimidated by the idea of crossing the highway to try it anyway. I haven't talked to the owner, but the workers there don't seem to know of any definite timetable for the closure of the exit that allows you to pull off the highway, drive through the opening in the fence that borders it and drive the 50 feet to the orange stand. The nearest legitimate freeway exit that will survive once the highway is upgraded to official "freeway" status is about one-half mile away. With proper signage the business could still remain where it is, but it would certainly suffer from the loss of those people who spontaneously pull off to eat and look at the place. I'll let you know what is happening. There definitely is a Giant Orange stand near Chowchilla, CA--I just ate there about 45 minutes ago. This one operates under the name "Mammoth Orange" and is apparently the last of it's kind along Hwy. 99. The original structure is used only for order-taking and preparation of sodas and shakes (they do a wonderful orange shake). A conventional building was added to the rear of the sheet metal orange 10 or 12 years ago to house the upgraded kitchen and bathrooms required by state/county ordinance. The stand is located at one of the old intersections that still exist on rural portions of Hwy. 99 where it is possible to cross the highway. The state is in the process of eliminating these often dangerous crossings and the changes that are planned for the highway are the reason the business is in constant danger of being closed. The latest word, as of late March, '07, is that it will be forced to close in about six months, though there have been a number of previous closing dates that have passed with the business still in operation. The current (and fairly recent) owners of the business have hopes of moving the Orange to the nearly town of Chowchilla. Up until a couple of years ago there was another (derelict) Orange almost directly across the freeway, but it was finally removed. The fact that there were two within several hundred yards of each other is testament to how common they were at one time. The Mammoth Orange is located on the northbound side of Hwy. 99, just south of the intersection with Hwy. 152. If you'd like more information, let me know. The Dixon Orange is for sale.